In the morning fog I took the boisterous collie for an hour long walk, put together a playlist on my phone that consisted entirely of pre-1974 Quo then chucked the dog in the Porsche's boot, drove 10 miles to a friend's house and left her there for the day. "Keep your eyes on the road and your hands upon the wheel", blasted from the stereo. Good ethos. Provisions had been bought - water for liquid, coke for sugar, Red Bull for taurine and sandwiches for nourishment - and headed towards the A303. The fog burned off, the sun shone and we hit our stride. Legs outstretched, arms almost straight. 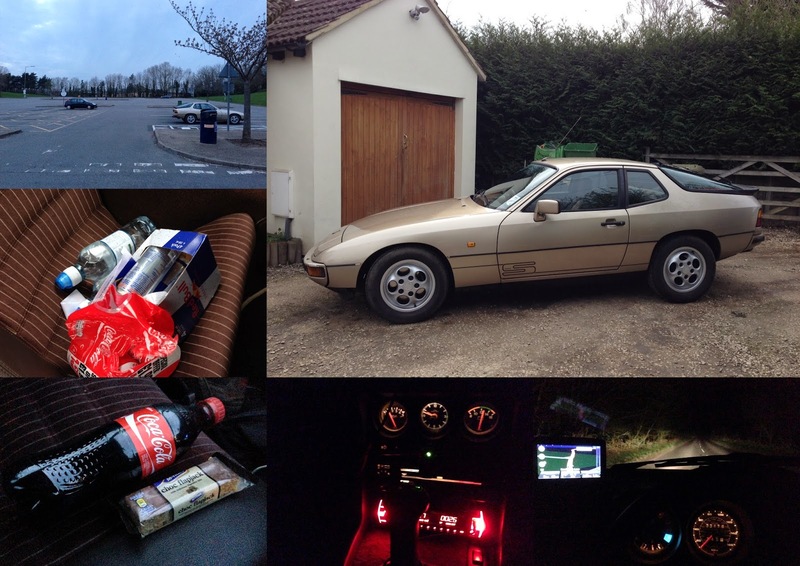 The old Porsche, a supreme cruiser - comfy seats, perfect driving position, booming flat-4 fed through stainless pipe, 3500rpm at 70mph, lower than everyone else, a spaghetti mess of wires from phone to stereo and TomTom to 12v pushed out of the way in the passenger footwell, provisions reachable from the rear +2 seats, sunroof open, window down. Eyes down, check dials - oil pressure perfect, voltage meter spot on, engine temp in the zone, fuel full. Mega. Eyes on the road. We pass Stonehenge - time for a quick snap in burst mode. Mid-day finds Somerset. The guy I'm meeting has five huge dogs. They smell mine and instantly love me. Two hours later crack the first Red Bull, scoff the first sandwich, head to Weymouth on the south coast. Dawdle down lazy Dorset lanes. Hit the seaside - another meeting. Back on the road. Coke, another sandwich. Stop to water a hedge. Mile after mile of two lane black top and we're headed for north Devon. Late afternoon and 200 and something miles down and I'm wired from driving, synchronised with the car's mechanical din. The best way to spend a spring day - no doubt. I'm on a section of dual carriageway. A truck coming the other way flashes at me - what's wrong? Then a car, then another. Flash flash. A thought occurs - camera van full of cops ahead. I get the fear, slow down even though I'm within the limit already. By the time I see the blue and yellow van of hate I'm doing 50 in a 60. Paranoid, cowed by authority intent on criminalising us all. Pass by, resume the limit. Nearly 6pm and it's still daylight. I'm winding down tiny lanes looking for a farm. Find the farm and greet the farmer's nine, mud-dreadlocked border collies. They smell mine. Doggy heaven. I'd love to take them all home with me. 7.30pm and it's twilight. 150 miles of M5, M4 to go. The day has been a success but it's not over yet. Stop for more provisions. I've drunk all my coke and eaten the sandwiches. Water is not enough. Need more stimulation, and a flapjack whilst I'm at it. It's dark. Mile after mile pound by. The traffic is light, the Porsche's new xenons cut through the gloom, the Quo distort the car's crappy 28 year old speakers. Bliss. Fatigued, but not tired, from journeying. Eyes on stalks. Even more wired. Concentrate. Blend with the car and road in a zen-like state. I'm enjoying this. I could drive all night, but I need to get home. I've yet another early start the next day. 10pm - arrive at friends to collect the dog. 10 miles home down winding country lanes, murdering dozens of suicidal moths drawn to the headlights. Come across a slow moving car, driven erratically. Driver obviously pissed after a night at the pub. Moron. He turns off, good. Arrive home at 10.30pm. Park up the Porsche. 28 years old and it's done 500 miles in 24 hours without skipping a beat. What a legend. I love that car. Home, make tea, sit on sofa, put crap on the telly, write this. It was a good day. Days on the road usually are.